Finishing projects isn't something that happens around here. Every square inch of house requires major work, much of which will be costly future projects. In the meantime we work on the structural and stabilization aspects, and then apply a bit of lipstick and salvage to make everything look passable in the meantime. Our stairs are a prime example of this. We lived in the house for a year before deciding that the roundabout route to get upstairs was intolerable. 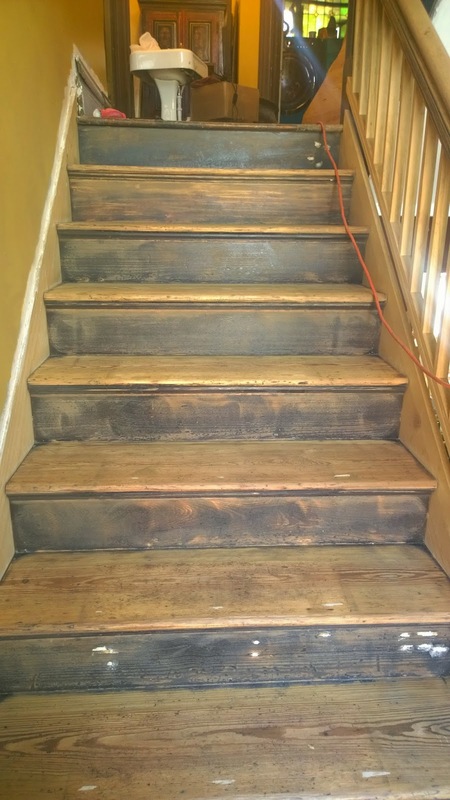 As I've mentioned before, the house was split into a multi-family in the '20's, at which time the ornate stairs, entryway, and most of the woodwork was removed (see this post and this one if you've not read along from the beginning). After finishing the first round of structural work we didn't touch the stairs for over a year besides just patching the plaster. It was only when we had friends with a baby coming back in March that I got the itch to make them prettier. 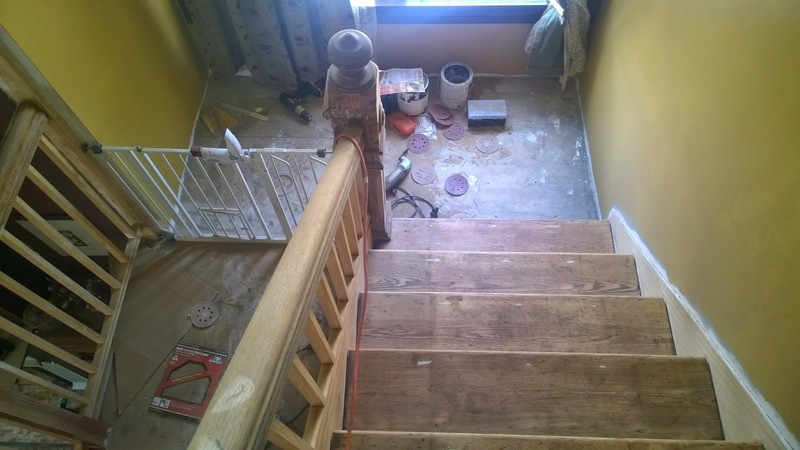 What we were working with were the very beat up pine treads we reused from the 1920's stairs that were removed, a salvage newel post, and qswo handrails we had salvaged from two different houses. As you can see, they were rough... 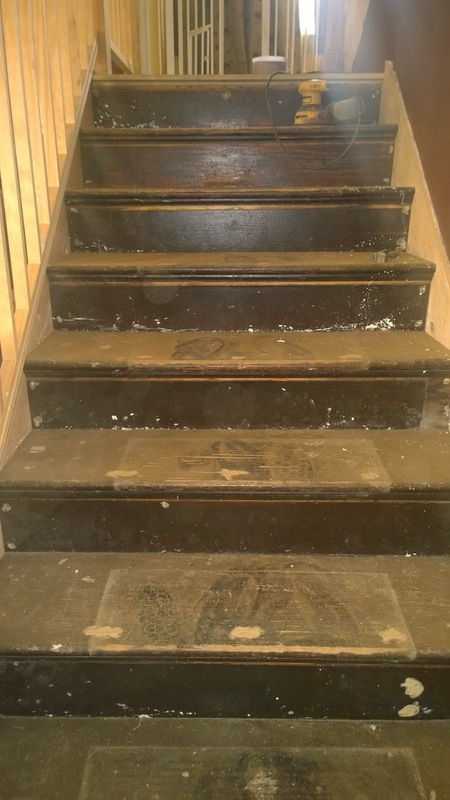 They still had the outline of the rubber treads I had removed, and were covered in worn paint (as well as the requisite holes and splintering wood). 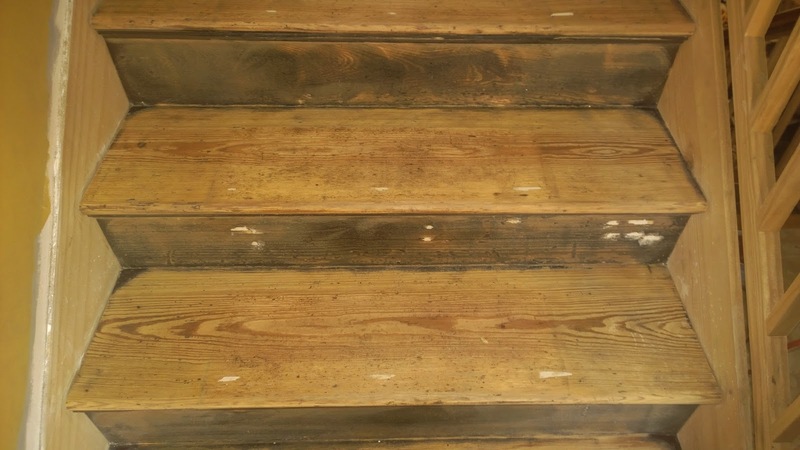 The treads got sanded by hand with my orbital sander, with 60, 80 and 120 grit. Since the risers would have been a bear to clear finish, they got sanded with 80 in preparation for paint. 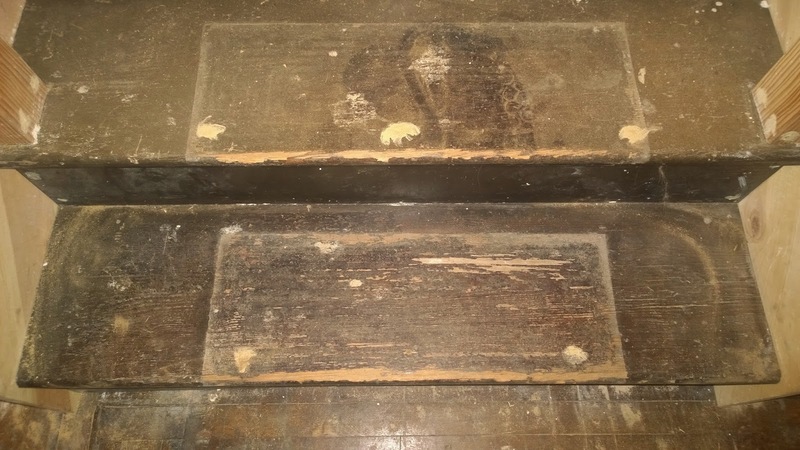 As you can imagine, this turned my house into a dust bowl, since there is no feasible way of sealing off two runs of stairs that span a three story house. Obviously I was thinking very clearly when I decided to undertake this project two weeks before we had guests. Did I mention I also decided it was the appropriate time to strip the ornate newel post and the handrails? Needless to say, it's six months later, and the project is only now finishing up. Hopefully the sun will come out today and I can try to take some halfway decent photos - hey, there's a first for everything right? I get it ... we live in a very similar situation, with no finished space in the house and more unfinished projects than I can name. Sanding indoors. Since you're using an orbital sander, hook the hose of your shop vac to the sander and run the vacuum while you sand. (My little Makita had a round output and it fit the vacuum pretty well. My new Dewalt is a tight fit and I use duct tape to make sure it stays secure.) This greatly reduces the dust of sanding, though the noise is almost intolerable. Hearing protection is a must. I've done that with great success in the past (although it's a tip that bears repeating)! But oh the noise!!!! Even with the ear protection given to me by a friend who worked on the tarmac as a baggage handler the vibration of both machines is enough to drive one mad. In this case, there was just too much of a chance of me accidentally dragging the vacuum down the stairs to risk it. This is a fantastic post. Informative and interesting which we share with you so i think so it is very useful and knowledgeable. I would like to thank you for the efforts. I am tiring the same best work from me in the future as well. Thank you for this information. My husband wants to do the same thing in our hose next summer. I hope it will look the same way. The result is nice. My wife also want to repair the stair. I will try doing this way. Thanks! Please! Share with me your next posts. Really great work , i love the stairs so much, thank you for sharing this !